Happy Friday!!! I managed to survive my first week of the winter semester. I think I am going to like all of my classes, so it should be a great semester! Sale-a-Bration (SAB) is coming up at the end of the month! SAB starts on January 28, and during this time you can earn FREE products with $50 orders! The card I have to share with you today is sneak peek to some SAB products! The stamp set I used on this card is called Banner Blast. Aren't those little banners just adorable! The best part is that there is a coordiating Banner Punch availible during SAB too! 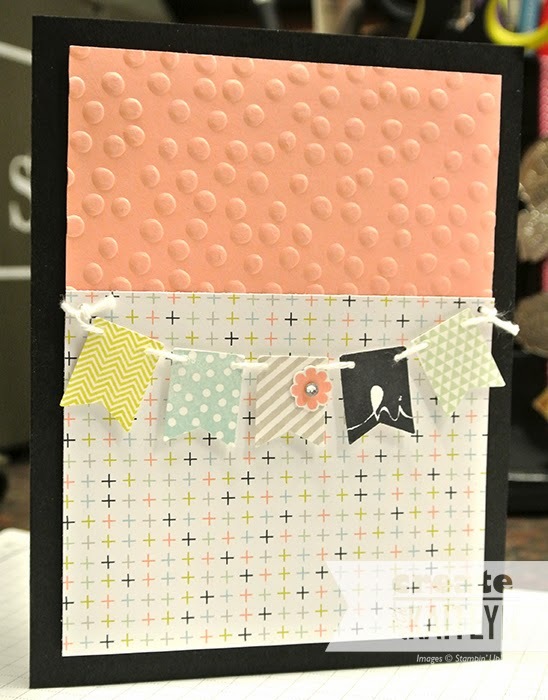 The Sweet Sorbet Designer Series Paper and Decorative Dots Embossing Folder (my favorite SAB item) are also SAB items.